1. Some of my clients get piercings. 2. Some of my clients have teenagers that want body piercings and the parents want to make sure they go to a safe place. 3. I’ve had good and bad experiences with Professional Piercers myself and want to warn others of the safety issues involved in paying someone to make small decorative holes in your skin! Maybe you are a parent who has a little darling that decided he or she wants a piercing. maybe it’s in her ear, or his eyebrow or whatnot. And you, being the responsible but “cool” parent that you are, want your child to have a clean and safe body modification experience. When I was a kid I begged my mom to let me get my ears pierced. Other friends went to the mall and had a retail clerk shoot a earring into their ears with a gun. But not my mom, the former nurse! After much deliberation, she marched me to our primary care doctor and had him use a surgical gun (likely the same model as the mall’s gun) to pierce my delicate ear lobes. As an adult, when I wanted a second hole in my earlobe, I went to a professor piercer. Nowadays body piercing is not as big a deal as it was back when I was a child. And kids and adults are piercing more than ears. Who can you trust to pierce your body or your child’s body in Chicago? 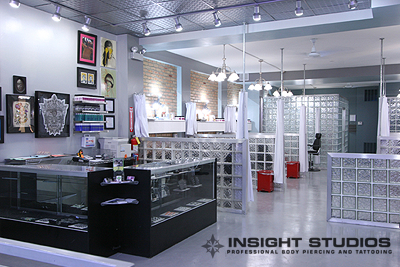 If I had kids, the only professional piercer I would take them to would be Bob Jones at Insight Studios on Milwaukee Avenue. Why? Because Bob is as close to a doctor as you can get as far as body piercing goes. He does not have a license to practice medicine, but he is well-trained and highly skilled. One of the things I like about Bob Jones is that he is meticulous and extra cautious about cleanliness and hygiene. He knows his way around an autoclave and isn’t afraid to check ID (to make sure his clients are of legal age for piercing). I met Bob when he used to work at another studio. Bob gave me great advice for helping me heal a slow healing piercing after a different piercer gave me bogus skin cleaner advice. When I went in for a new piercing, I know I would only go to Bob. I’ve since let my second earring hole heal up, but if I ever want any other piercings, or if my clients, or relatives want any, I send them to Bob! 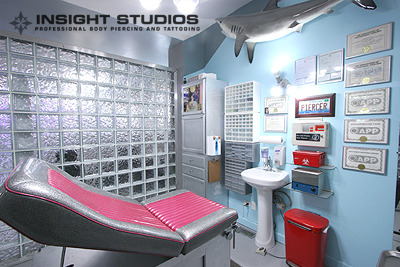 Insight Studios is one of the only tattoo/ piercing studios that offers weekly autoclave spore-testing in Chicago. The results are kept on-site to ensure that our equipment is sterilized using the highest standards in the tattoo/piercing industry. Bob Jones is also an animal lover. One Tail At A Time and Insight Studios presents “Tattoos For Tails.” On Saturday August 21 from 12p-10pm Insight Studios will donate 100% of the shop’s profits to help out “One Tail At A Time.” Any piercing or tattoo done on August 21 will have ALL proceeds donated to OTAT. Note: Neither Sue Shekut, nor Working Well Massage is affiliated with Insight Studios or Bob Jones. We get no commission nor kickback for recommending Bob Jones and/or Insight Studios. What I do get is the peace of mind I have whenever I send one of my clients to Insight Studios. I know I did my part to refer them to a safe, Professional Piercer! Nice article! It’s really important to go to a piercer you trust. Thanks for the useful info. If your clients are looking for piercing jewelry at a good price you can always buy from a wholesaler.